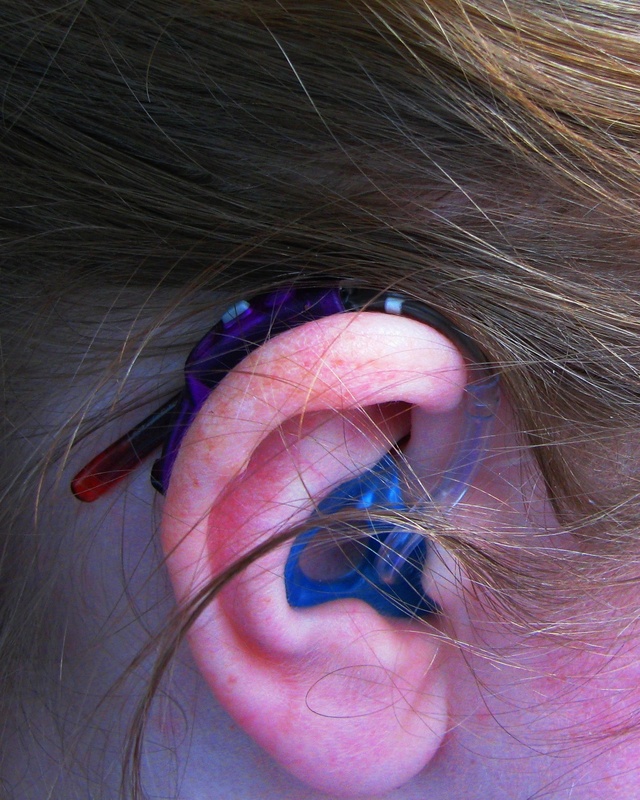 When you’ve worn hearing aids a long time, the acceptance level tends to be much higher. So what if people see my hearing aids when my hair is pulled back. Bring on those double-takes! 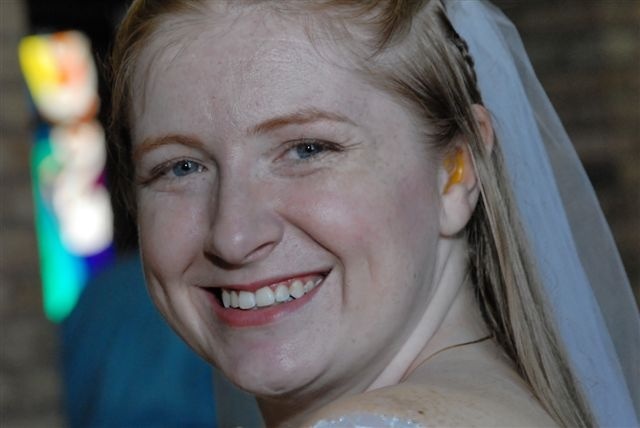 Blushing bride Elizabeth made a fashion statement when she walked the aisle with her hearing aids with bright yellow molds in full view. And her latest hearing devices are even more colorful. 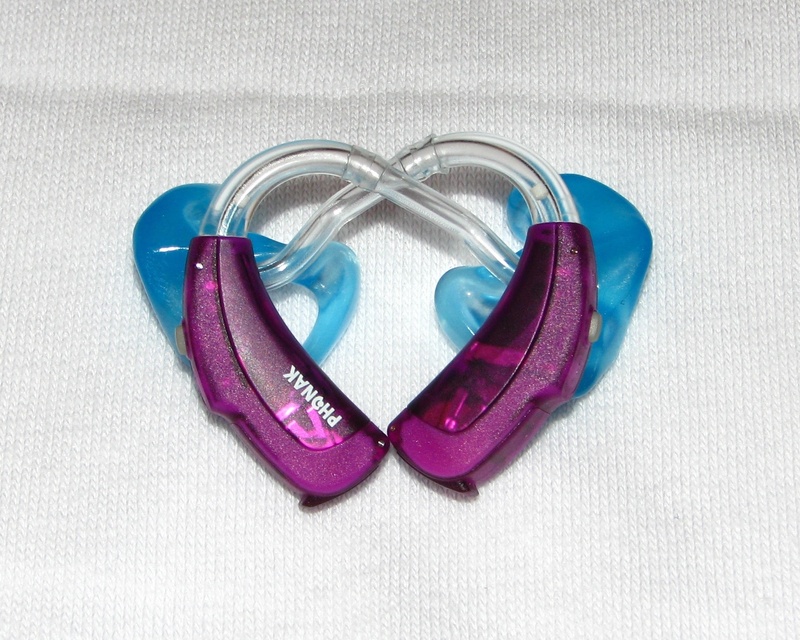 The busy mom of a two-and-half-year-old reminisces about her hearing aid choice from her wedding five years ago. Elizabeth got married, Show Me Your Ears style! “The yellow earmolds matched the daffodils in my bouquet,” Elizabeth says. And, just for fun, Elizabeth poses her new electronic ‘ears’ in the famous love symbol: a heart. Click Here to Email the following to Lipreading Mom by April 1, 2013. Include in the email subject line: #StopHearingLossBullying Video. Your photos and words may be included in the Official #StopHearingLossBullying Video to be featured on the #StopHearingLossBullying Page, YouTube, Facebook, and Twitter (#StopHearingLossBullying). Join the many people who have already shared their ear photos to spread awareness about hearing loss and deafness. 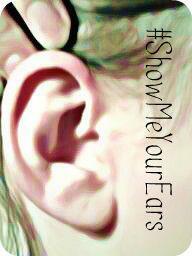 Participate in the Show Me Your Ears campaign today. I laud Elizabeth for showing off her hearing aids! However, the skeleton style earmold isn’t really appropriate: Instead, she should be using the shell style, as it doesn’t have the flesh peeking out. Also, I question the use of acrylic, as since she is young she most likely has firm skin texture & instead should be using soft silicone earmolds, as hard earmolds are used for elderly people who have flabby texture. I love your posts and would like to nominate you for the the Liebster Blog Award. See my website. @dholliness – Thank you so much for the nomination! It means a lot to me.